Those might be the first things that come to mind when seeing the title of today’s blog. While I know quite a bit about the game of basketball, I know zippety-zap other than the existence of the professional basketball team from my home state. On the former, I still remember my first trip to Disney World. I was older than the park. I was eight, and Disney World was only six years old. It was cold with drizzly rain. We had the park practically to ourselves. In my daddy’s words, “this was back before they had caught on”. Whatever the reason for being one family among the few, we had a great time. Back in those days, you needed coupons for the rides. My mom who is a meticulous saver of memorabilia still has our coupons from that day. When I called my parents to confirm my childhood details matched theirs, my mom shared she still has those coupons. My parents have moved more times than I care to think about since that December 20th date (yep, she recalls the actual date of our attendance), and yet, a piece of our day spent there has survived all the moves. If truth were told, I, too, have a few pieces, Disney World coffee mug and a Bear Country Jamboree patch, from our day. This trip in family lore has lingered on and absolutely could be described as magical. Less because of the theme park, and more due to our family being able to afford to go and enjoy it. At the time, my daddy was a graduate student and assistant coach (neither of which are high paying gigs), and for one day, even if it was less than ideal weather, we treated ourselves. Living life and making memories . . . a true definition of magical. The hoopsters and the hipsters known as Mickey and Minnie are permanently attached to the moniker “magic”. But for me, my whole definition of the word was transformed at the end of a dock in a marina slip. It was the least likely place in the world to experience true peace, but I wasn’t the only one who found it there. My sweetie who sadly isn’t always able to vacation with the kids and I laid down the law before we left for Florida for the Boy Wonder’s graduation trip. He sat our party of six down and explained other than boarding the airplane, there would be no, none, zero, zip, zilch, nada, NOT ONE IOTA of stress during this vacation. This was the trip of our dreams and he wasn’t going to allow any of us to sweat the small stuff. To demonstrate he was serious he mock threatened to implement an NCIS reinforcement technique. Despite his size (think football lineman), my sweetie is the gentlest giant among men I know. We were all in giggles when he suggested that any stressing would result in a Leroy Jethro Gibbs head slap. He got his point across although he had no intentions of actually doing it. He was the leader in the no stress brigade the entire trip. His vision of peace and tranquility came to fruition two minutes (I am not exaggerating here) after we arrived at our beach house. We were unloading some food in the kitchen, when his trained-to-look-for-wildlife eyes zeroed in on a blackish blob in the water behind the property. Curiosity won him over and he went to the dock to check it out. Giddy with excitement because he found what his girl was hoping to find. his discovery held us – all of us – captive all week. 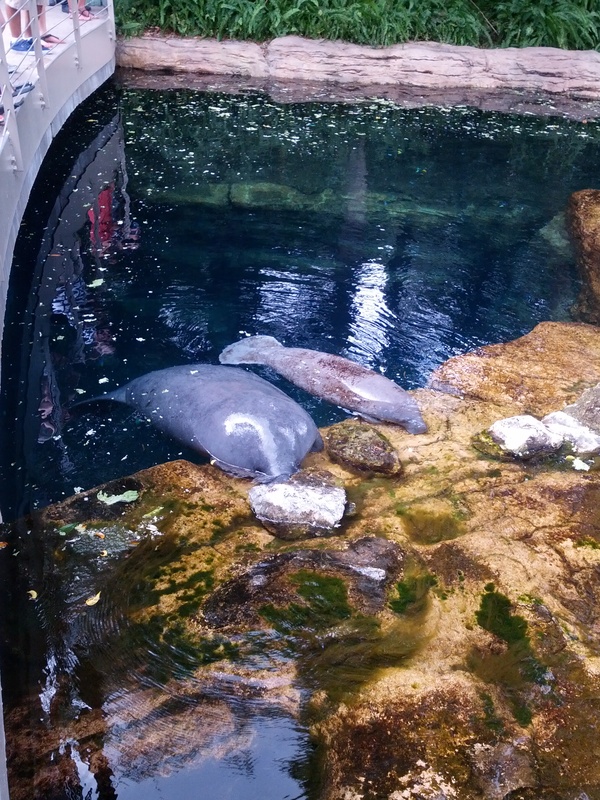 Manatees! Not just one or two, but more like six or seven. There were mommas and nursing babies and all other sizes in between. The marina slip despite its mucky appearance must have been a marine mammal smorgasbord, because they were there all week. To say we were captivated would be the understatement of the century. On the plane down, I told everyone despite growing up in Florida, the one thing I had never seen in the wild was a manatee. Alligators, crocodiles, snakes, sharks, and dolphins, I’ve got them covered, but not manatees. I had even searched for manatee tours, but felt that with Sister on crutches with strict restrictions from the doctor would not enjoy a boat tour at all. We did see some rescued manatees at Sea World, but that really wasn’t what I was hoping to see. Not the manatees from the dock who were extremely camera shy. These are the rescued ones from Sea World. The smallest among us at three months old really could take ‘em or leave ‘em (mostly leaving ‘em), but every other member of our party of twelve spent hours at the end of that small dock every day. The rising and lowering tide kept the rhythm of the island as we sat with legs dangling just breathing in God’s majestic beauties. In our tranquil observations, we learned some of their articulations and movements. Even when someone would call for a meal time, those at the water’s edge would wish to linger just a little longer, not wanting to miss one moment. Inside we had every modern convenience known, and as nice as those were, they didn’t hold a candle to God’s magnificent beach and the manatees in the backyard. We were all mesmerized by their peaceful life below the surface and wishing we could live our lives as freely. And for one week, we did. I couldn’t ask for anything more magical than that. It sounds like you had a wonderful time — so glad you were able to take some time off and enjoy a trip together! Oh Daisy – it was fabulous, and I am thankful beyond measure for the deposit made in our memory bank.